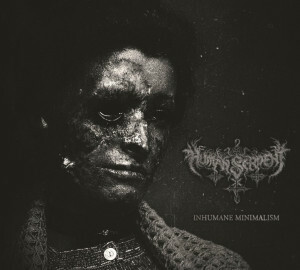 It is fitting that Inhumane Minimalism, the second record from Grecian black metal duo Human Serpent begins with almost no fanfare. In fact, “The World In Coffins” starts almost immediately almost with disdain that you were not already listening. This immediacy is a corner stoner of a record which wastes little time getting down to business. This business maybe a systematic and visceral dissection of hope and happiness. If you are not familiar with Human Serpent, Abyssic Black Cult Records, Nebular Winter Productions, or the 2013 six way Grecian black metal split which included Human Serpent along with Opus Magoru, Silent Dominion, Varg Order, Thaer Os Valael, and Funeral Storm do not worry. Not a lot of people have — including myself. What is interesting is that every year more and more material is uncovered from Greece as being a vital organ for the circulation of vile material. Inhumane Minimalism continues this tradition by offering a relatively short blast of no nonsense black metal with tracks that never breech 5 minutes. Though short in running time, the amount of ferocity contained in songs 2-3 minutes long is ferocious enough to cover perhaps a few years of misery. At this moment, Inhumane Minimalism has been out for a few months. It is sort of disappointing that it took this long to get around to this record but suffice to say its potency has not waned in its short existence. Songs like “Starving Void Upon Earth” have a chaotic existence which is similar to swarming insects which carries the same amount of immediacy as the album’s opening track. there is little time to waste when their is so much ground to sew with salt. There is much to destroy.